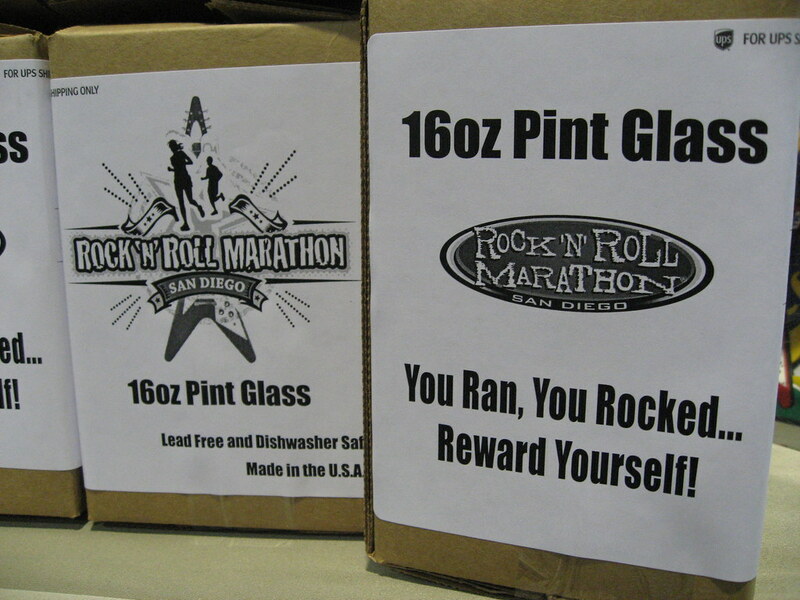 It's hard to believe after all those months of training for the San Diego Rock 'n' Roll Marathon that it's over. I would recommend joining Team In Training without hesitation to anyone who is new to running and interested in participating in an endurance event. Without a doubt, they have mastered the formula to make sure you get to that finish line. As nervous as I was, when it came down to it, I was prepared - both mentally and physically. 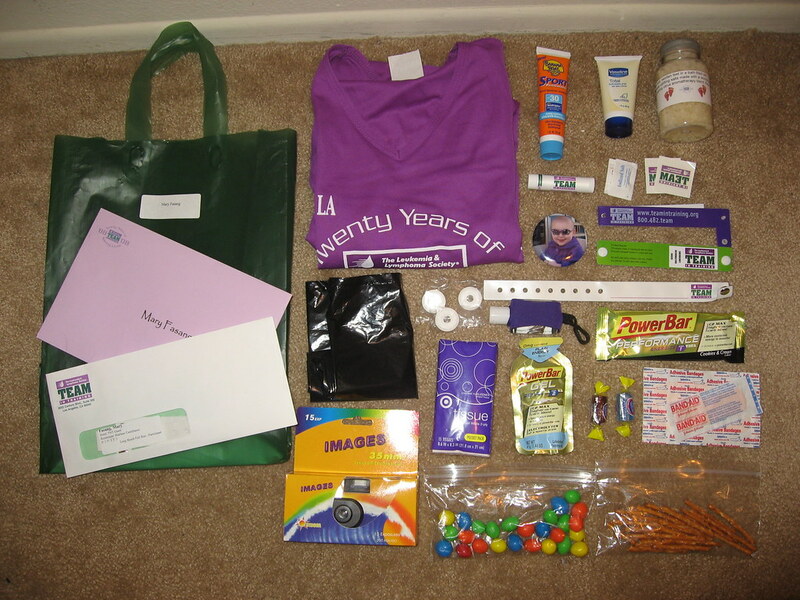 Even the goodie bag they presented us with at our send-off party contained items we would need for the race. 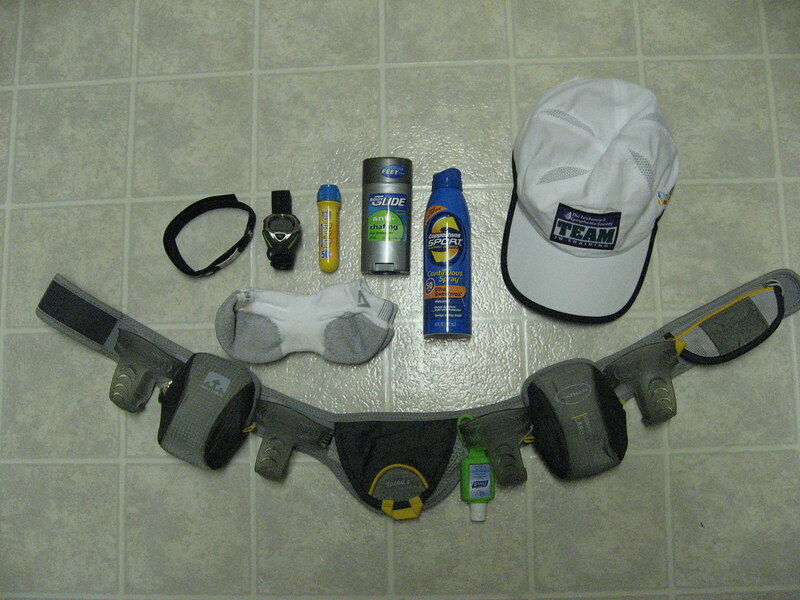 I had a lot going on the week leading up the marathon. On Tuesday, I failed my Cisco BSCI exam which essentially means I'm going to lose all my Cisco certification. On Wednesday, I graduated from California State University, Long Beach (CSULB) with an MBA in Information Systems. 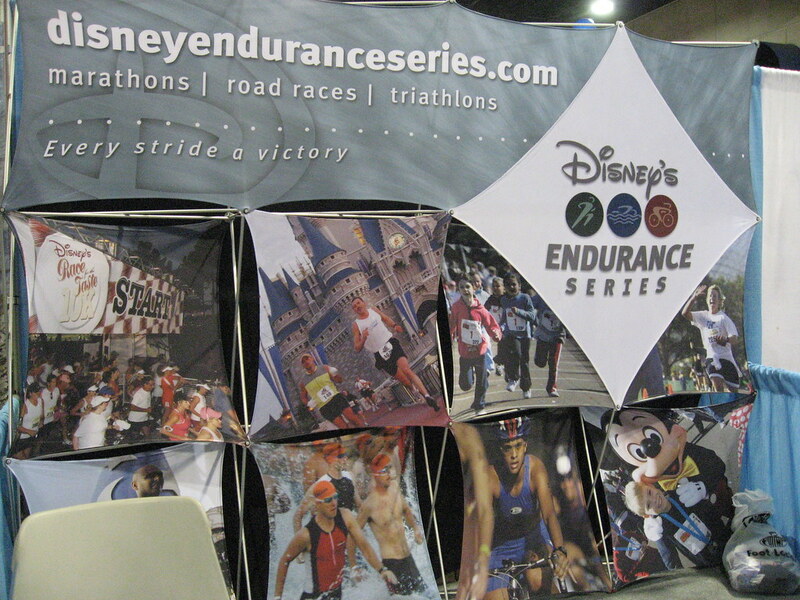 Initially, I was going to have to work both before and right after the marathon because of an office relocation. Due to circumstances beyond my department's control, we had to postpone the move two weeks at the very last minute. You can imagine the weight lifted off my shoulders when that announcement was made. I'm not the type of Green Girl who does things at the last minute. I'm very deliberate and methodical. 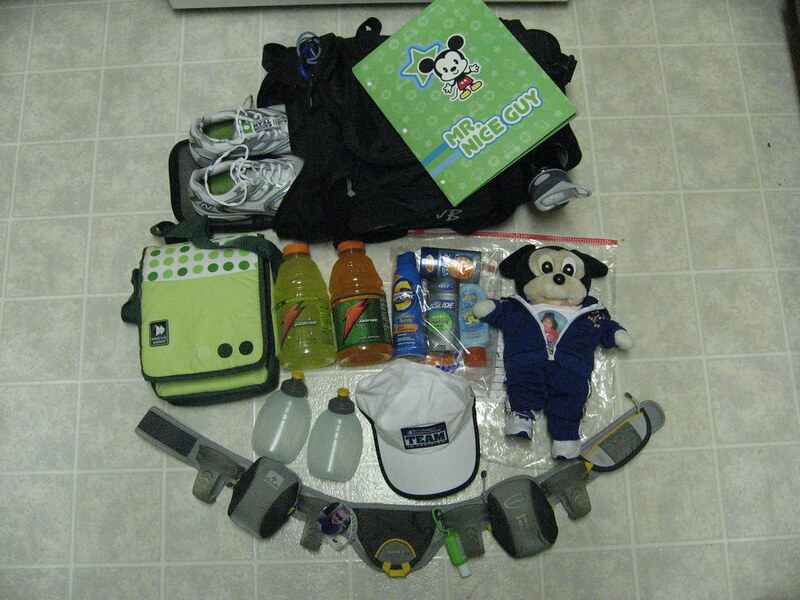 I had started putting together my marathon packing list months in advance because I already knew what a crazy week I was going to have. 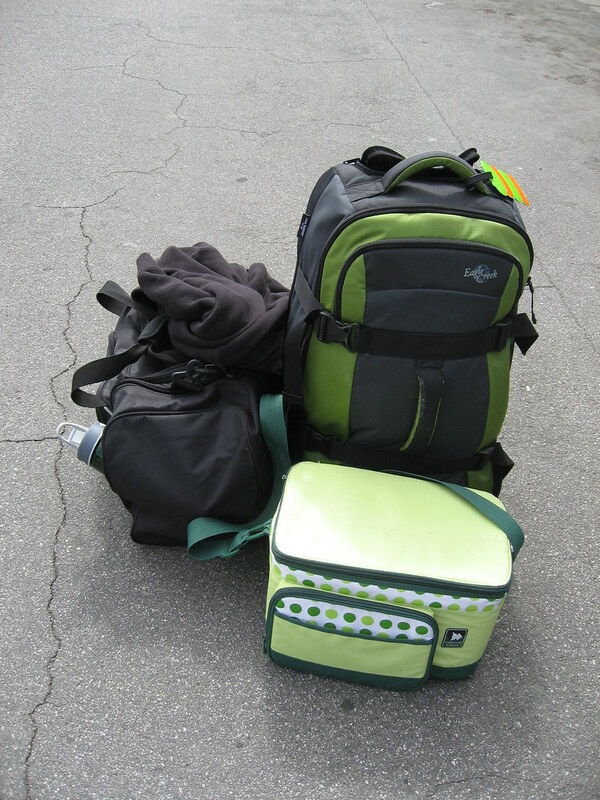 I packed a duffel bag and a luggage. 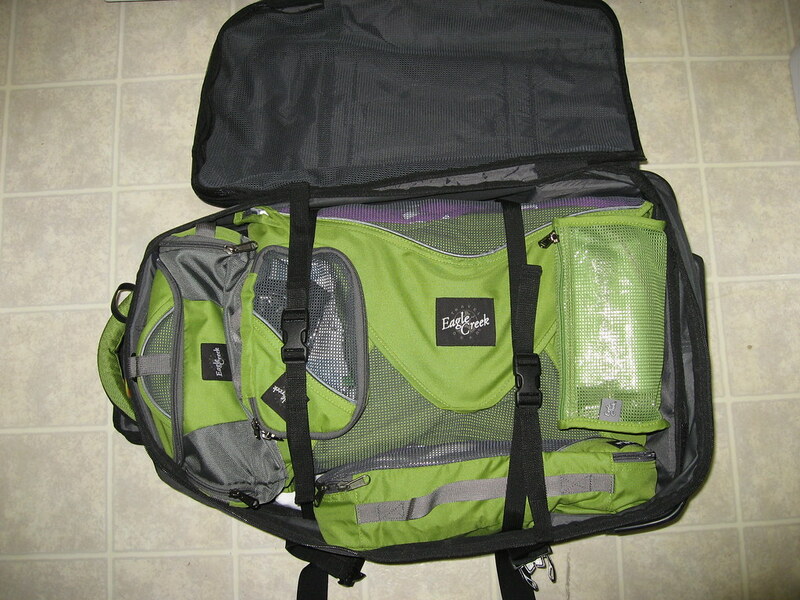 I didn't realize how much space my hydration belt would take up because I had never put it in a bag before. Heh. 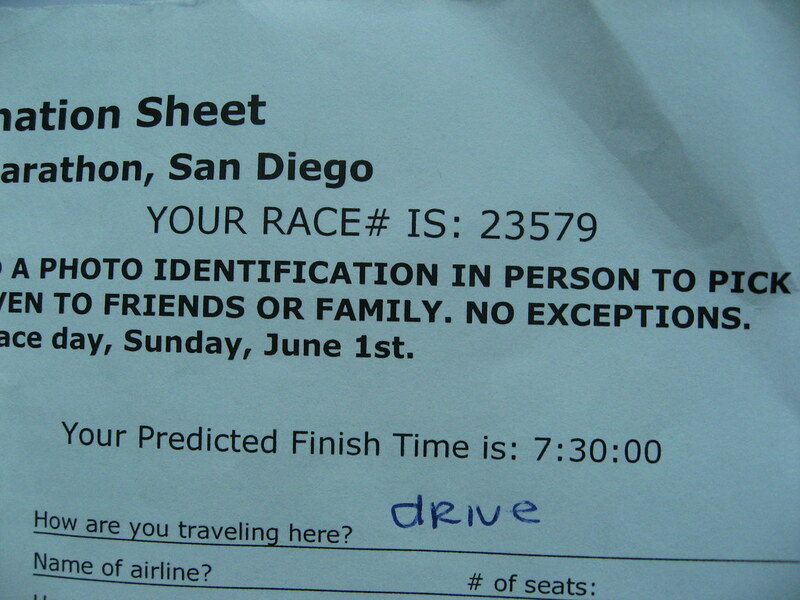 I carpooled down to San Diego with one of my TNT teammates, Marlene. Saturday morning, I waited for her outside my apartment with my bags. We stopped at East Coast Bagels so I could grab some breakfast and then we stopped at Ralphs to stock up on sports drinks, snacks and some fruit. Now that we were in the car and actually on our way down to San Diego, reality started really sinking in. 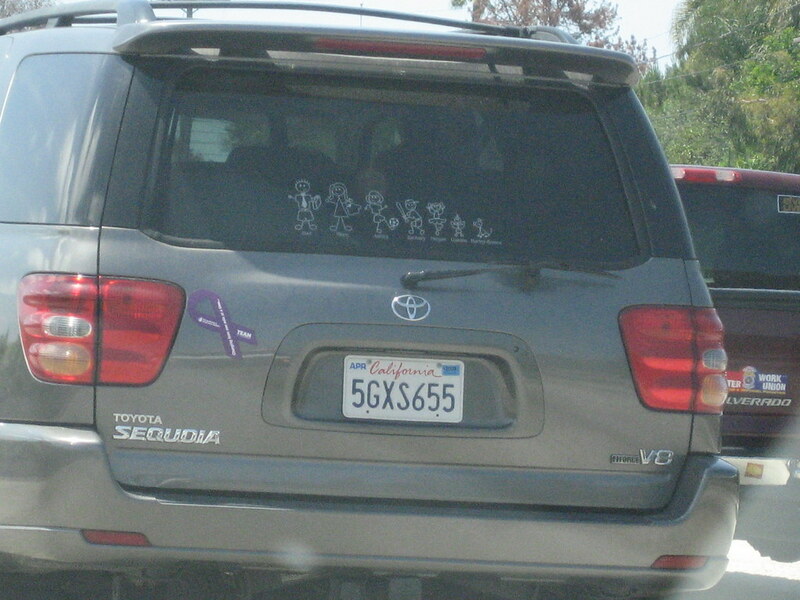 We spotted a car with a purple Team in Training ribbon magnet and we got excited. 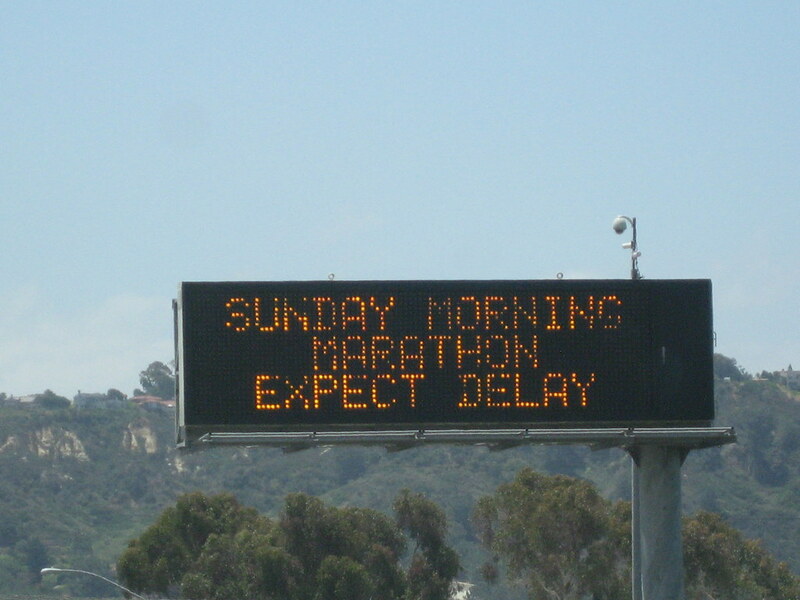 We also saw a 'Sunday morning marathon expect delays' sign off the 5 and we cheered. 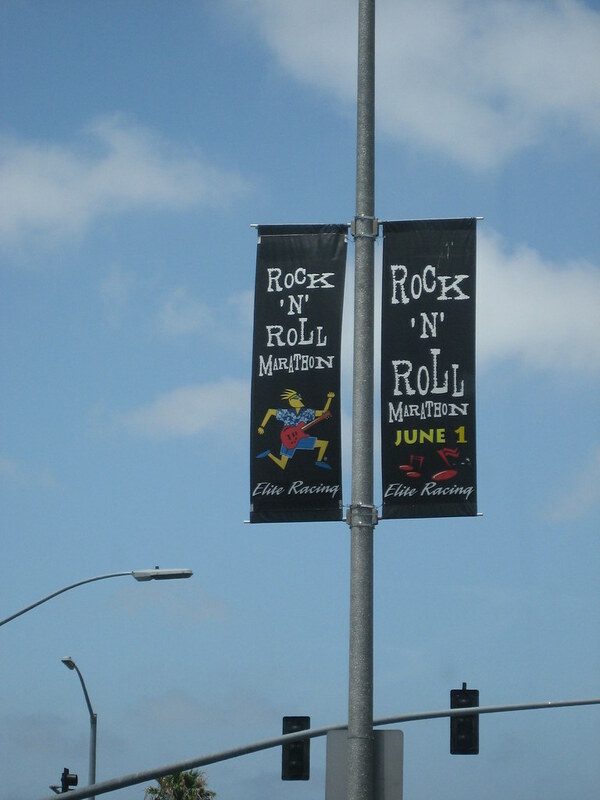 As soon as we got off at the Sassafras exit, we saw marathon banners. 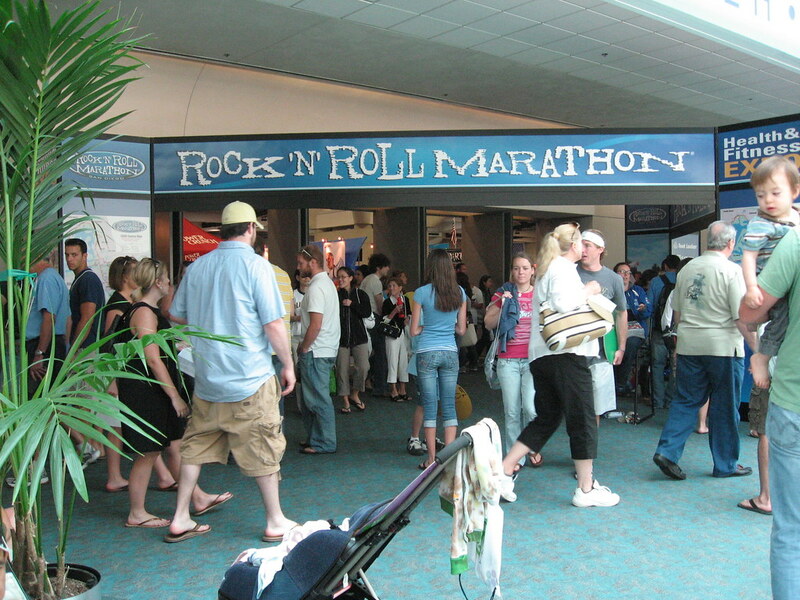 Our team was staying at the Sheration San Diego Hotel & Marina so we figured we'd go ahead and park there and just take a shuttle over to the marathon expo. 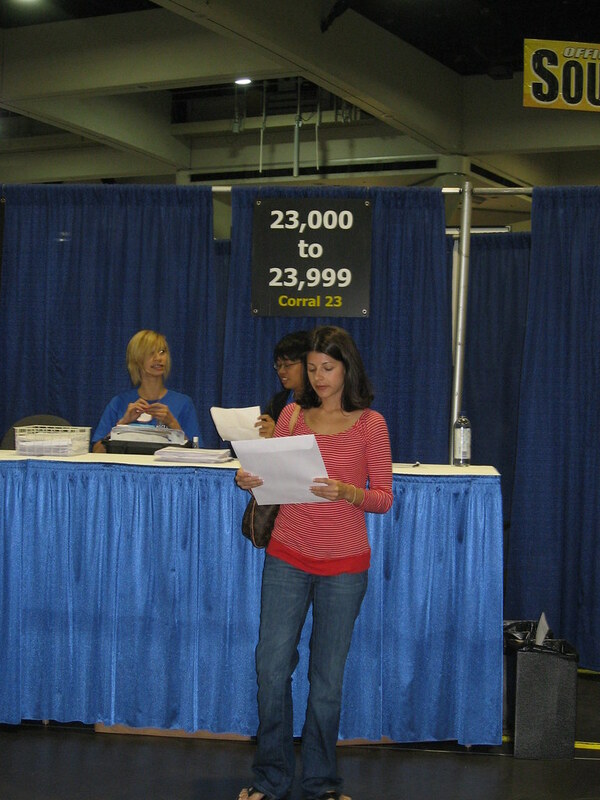 As soon as we arrived at the expo, we quickly filled out our race confirmation sheets and then submitted them to the appropriate corrals. 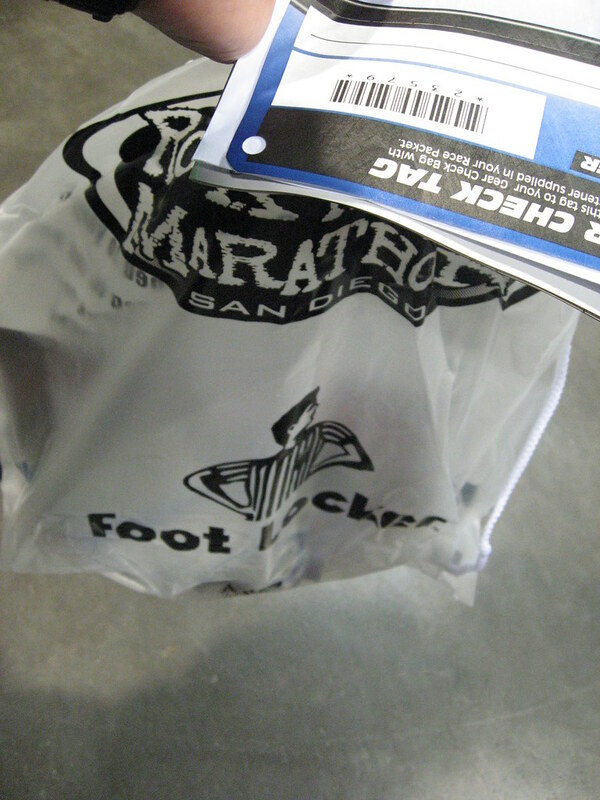 I had estimated my finish time to be 07:30:00 so I went to corral 23, the last corral, and got my bib and race packet. 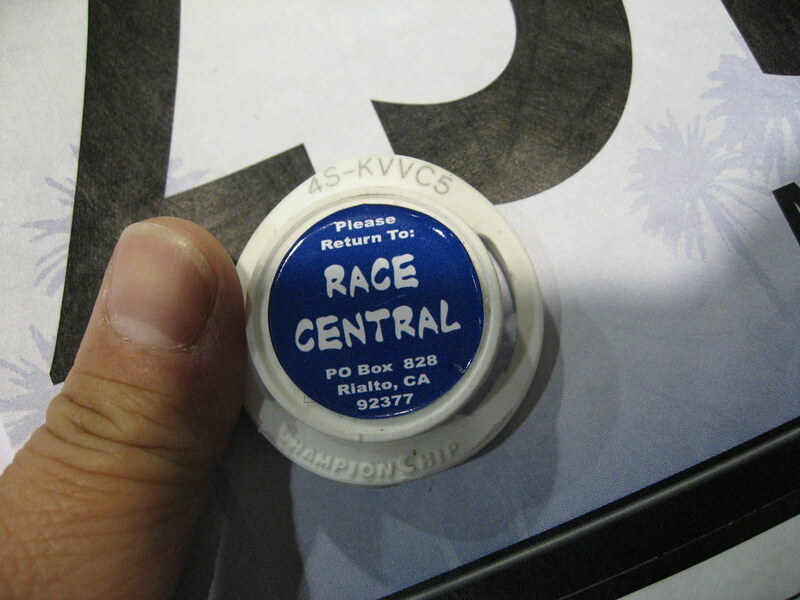 After that, we got in the chip line where they scanned our bibs with a bar code reader and then registered my chip with my bib number. Finally, we got our goodie bags and t-shirts. 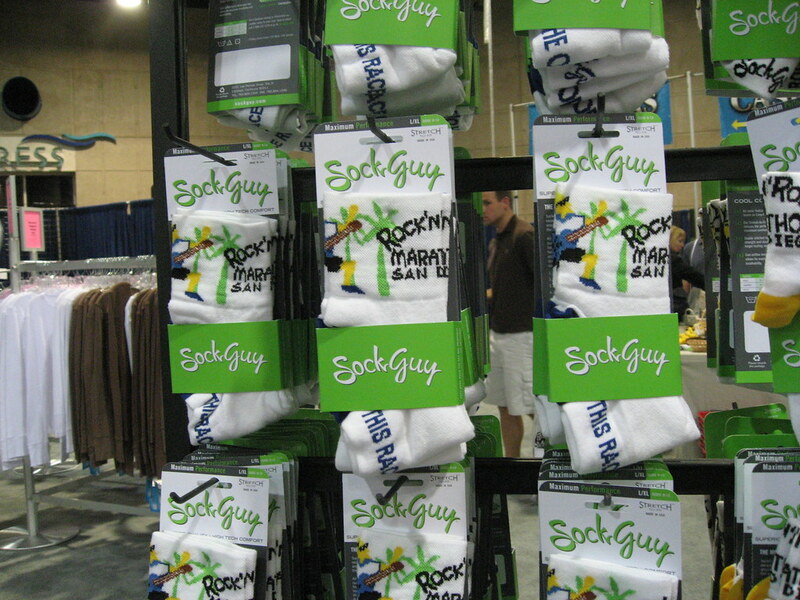 The first section of the expo was all San Diego Rock 'n' Roll Marathon merchandise. 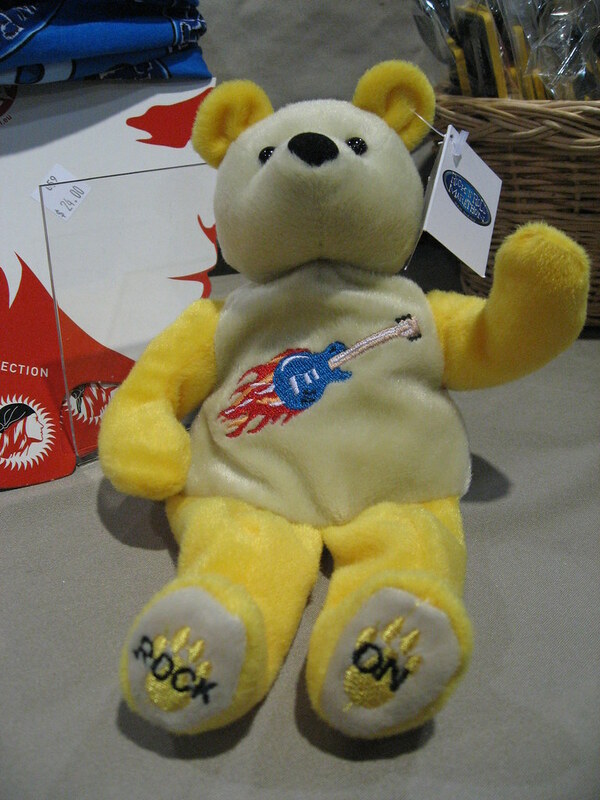 I saw everything from socks to drinking glasses to teddy bears. 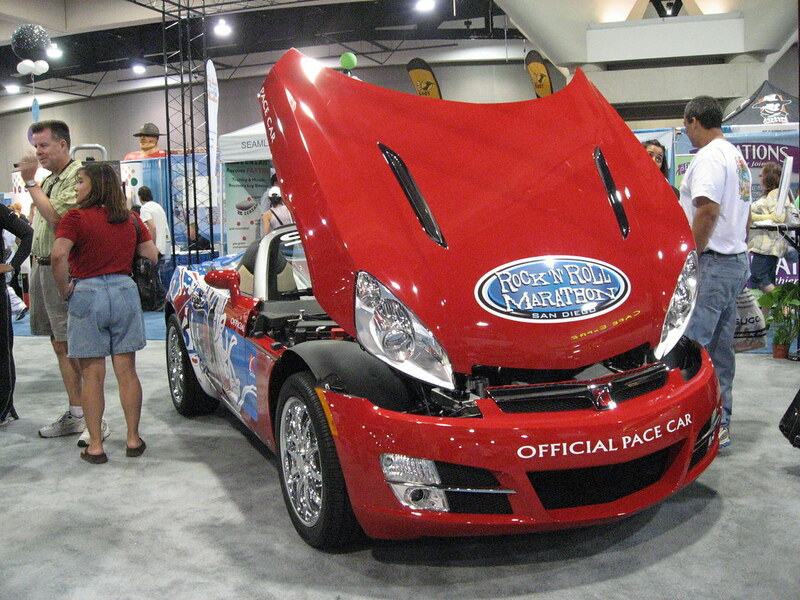 We even got to see the offical pace car. 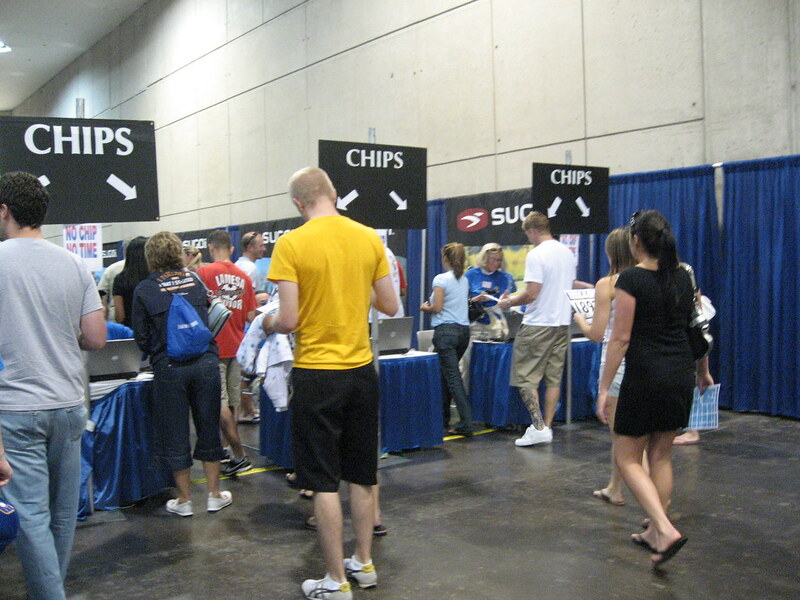 Once we passed through that area, we entered the main expo which was filled with vendor booths. I saw this one t-shirt that I loved - it said 'this is my race pace'. 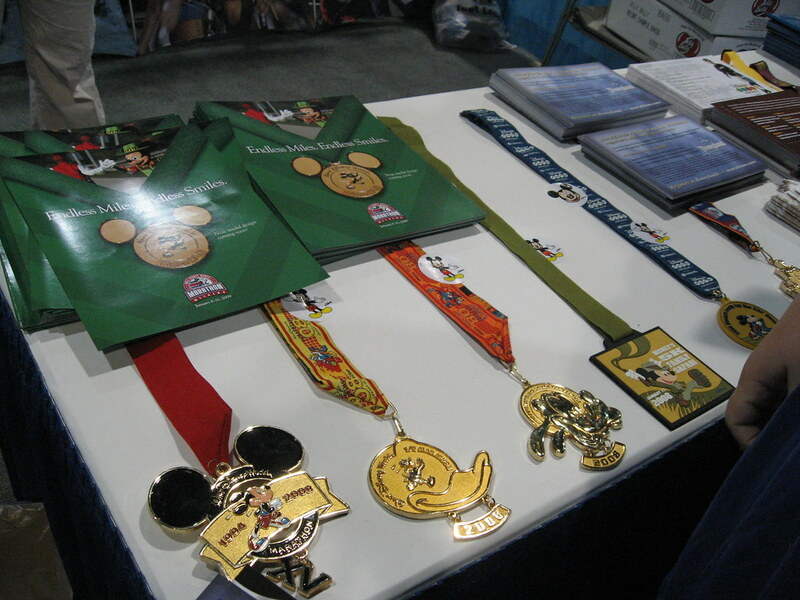 I coveted the disney medals for awhile at the Disney Endurance Series Booth. At the expo, we had our first Elvis sighting. This marathon is known for all the running Elvii - no, prior to this race, I didn't realize there was a formal plural form for Elvis. 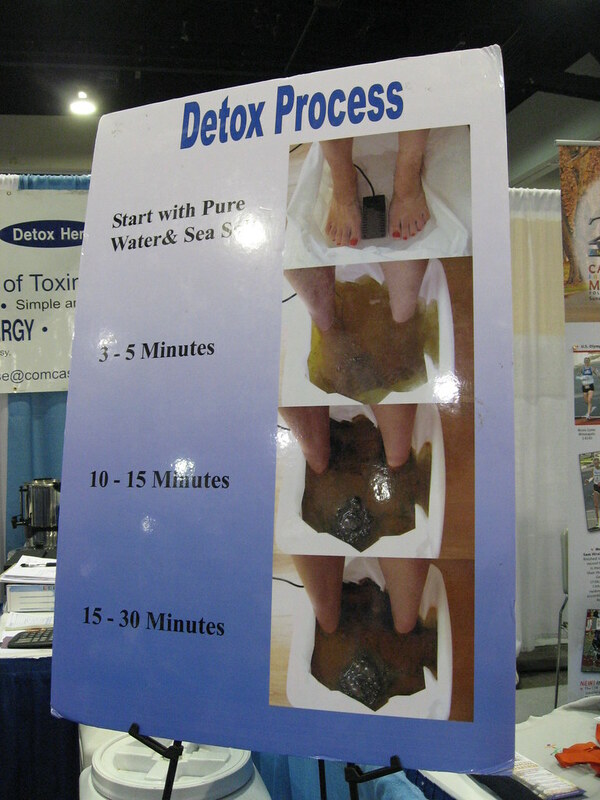 The weirdest thing we saw at the expo was the detox booth. They had all these people putting their feet into foot spas with pure water and sea salt and somehow all this gunk started accumulating in the water. It was so crazy. I kept commenting that a swamp monster was going to emerge from one of their foot baths. I had decided awhile back that my reward for completing the marathon would be a running charm for my Italian bracelet so you can imagine my excitement when we saw the Marathon Charms booth. 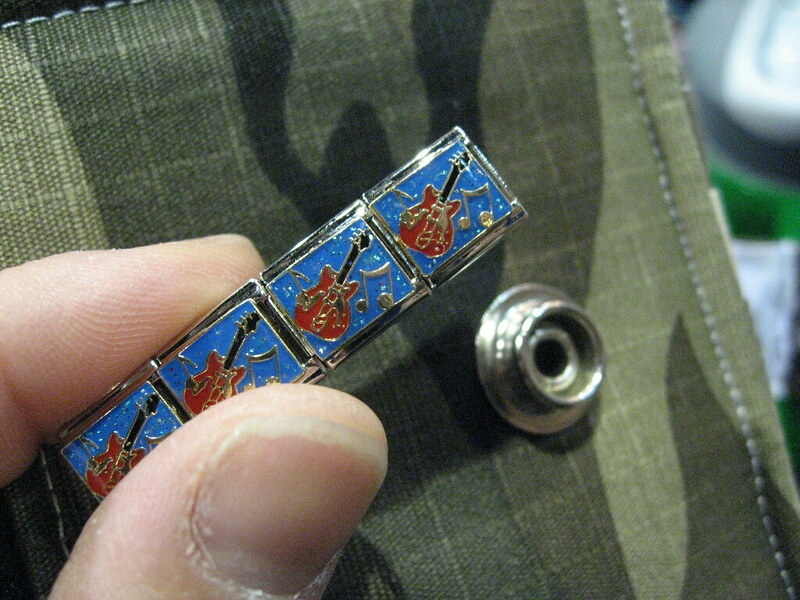 I asked the worker if they had a charm for the marathon and she showed me the rock 'n' roll guitar charm. I bought it but didn't put it on my bracelet because I had to complete the marathon before I could prouldy wear it on my wrist. After the expo, we took the shuttle back to the hotel and checked in. 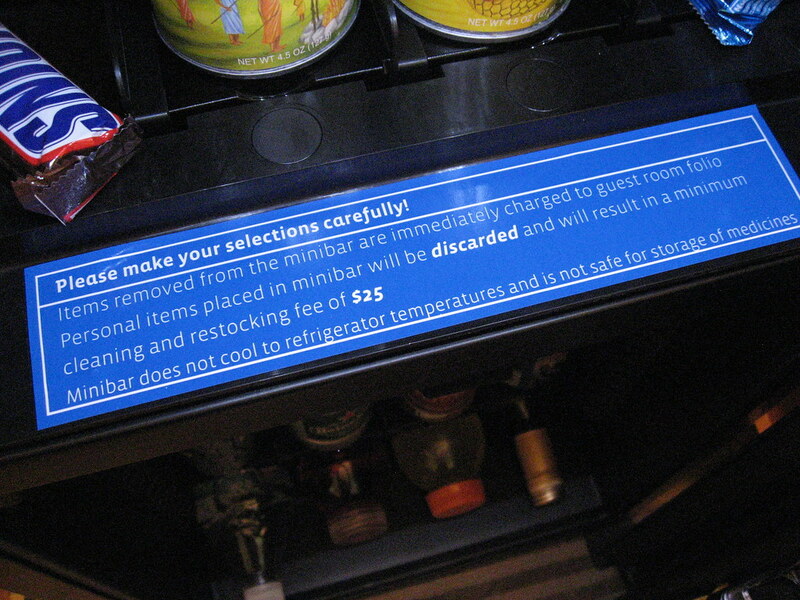 We were disappointed to discover our room didn't have a fridge we could use to chill or freeze our drinks. 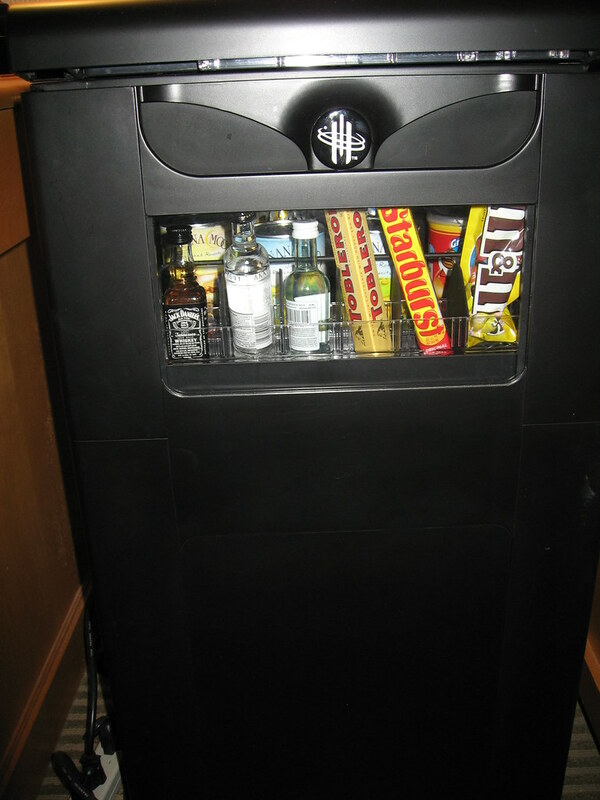 Instead, we had this mini-bar/vending machine. I didn't read the warning at first and I removed a couple of bottles. I ended up having to call the front desk to ask them to remove the charges. Luckily, I brought my cooler so we filled it with ice to keep our drinks cold. We met up with the rest of our team in the hotel lobby at 16:30 to take a shuttle to our pasta party. As we arrived at the carbo-loading dinner, the Team in Training campaign managers, mentors and volunteers cheered, clapped, rang cowbells, screamed and yelled for us. 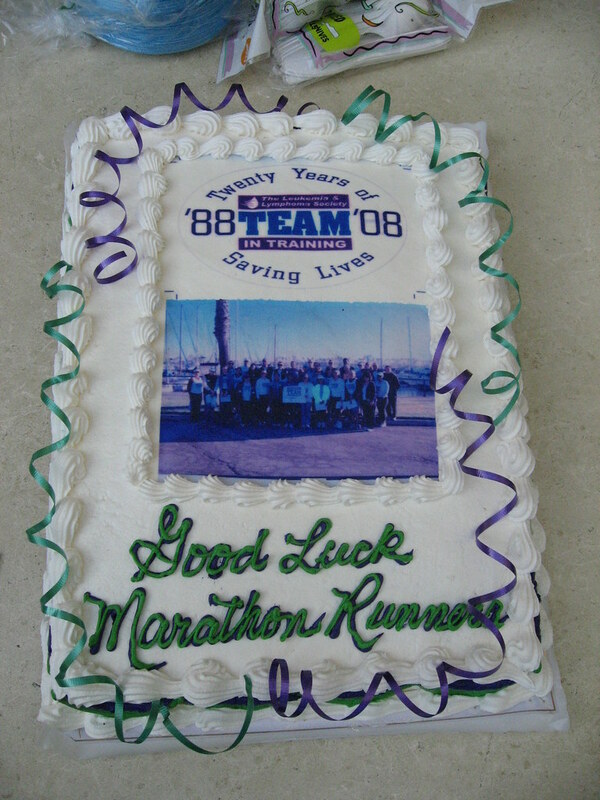 It was a really nice welcome and marathon precursor. I got really emotional and it really made me feel special. The dinner was simple but satisfying. I had a salad with a vinaigrette dressing, grilled vegetables, pasta with a tomato sauce, grilled chicken breast and a dinner roll. 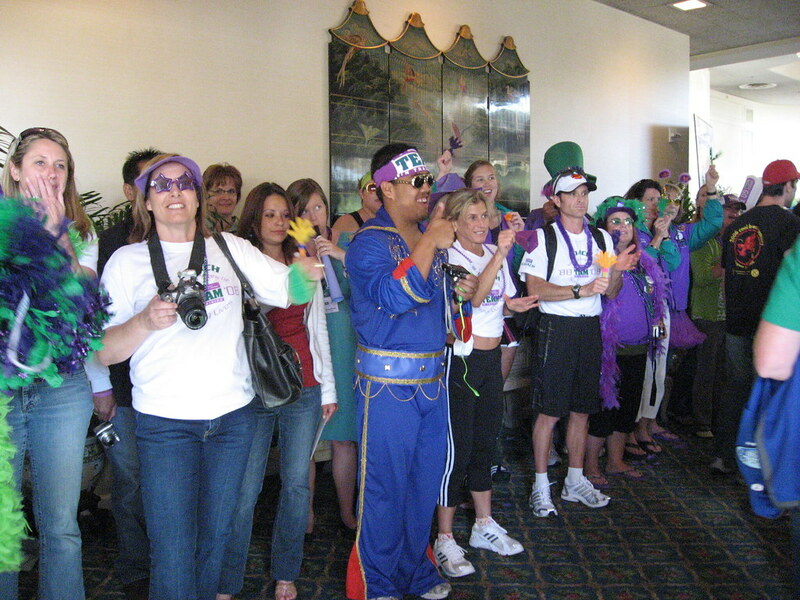 It was absolutely exhilarating to see so many Team in Training participants all at once. John 'The Penguin' Bingham was one of the speakers at our dinner. I was really looking forward to seeing him. If you ever get a chance to hear this man speak, I would highly recommend it. He was both amusing and inspiring - especially to use slower 'back of the pack' runners. I immediately understood why Team in Training selected him as a speaker. A lot of those doubts and fears in the back of my mind were assuaged - at least temporarily - as I listened to him. My favorite story was one where he was talking to an elite runner and he asked the elite runner what was the longest they had ever run non-stop. The elite runner said something like 3 hours and asked Bingham what his longest run was. Bingham told him something like 5 or 6 hours and the elite runner couldn't believe he could run for that long. Bingham joked that this proved while the elite might be faster than us slower runners, we were in better shape. 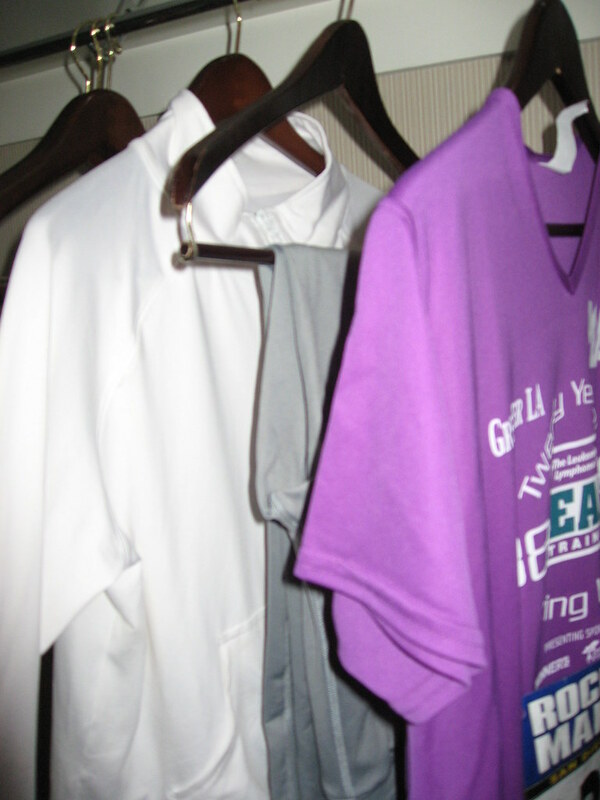 When Marlene and I got back to our room, we started our preparations for the next morning. With Bingham's speech fresh in our minds, we knew we had to take care of everything tonight before we went to bed. 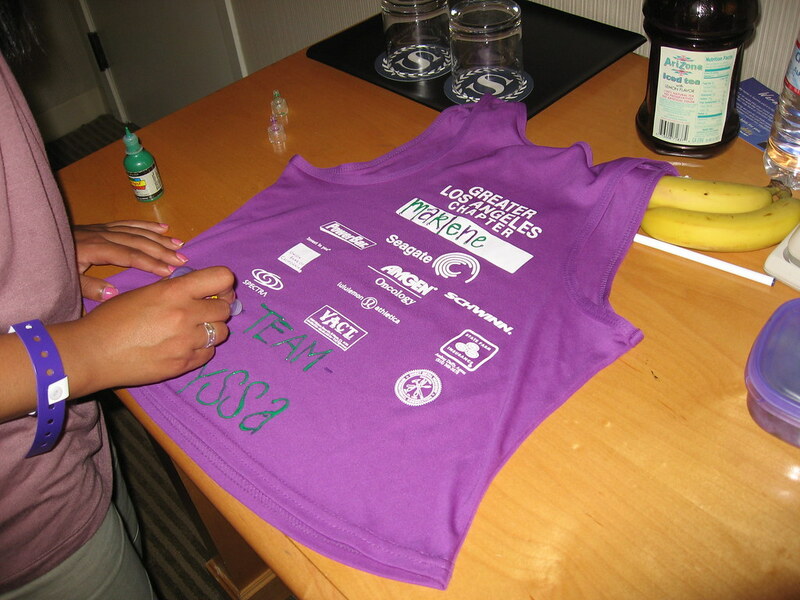 I safety pinned my bib onto my shirt while Marlene decorated hers with puffy paint. 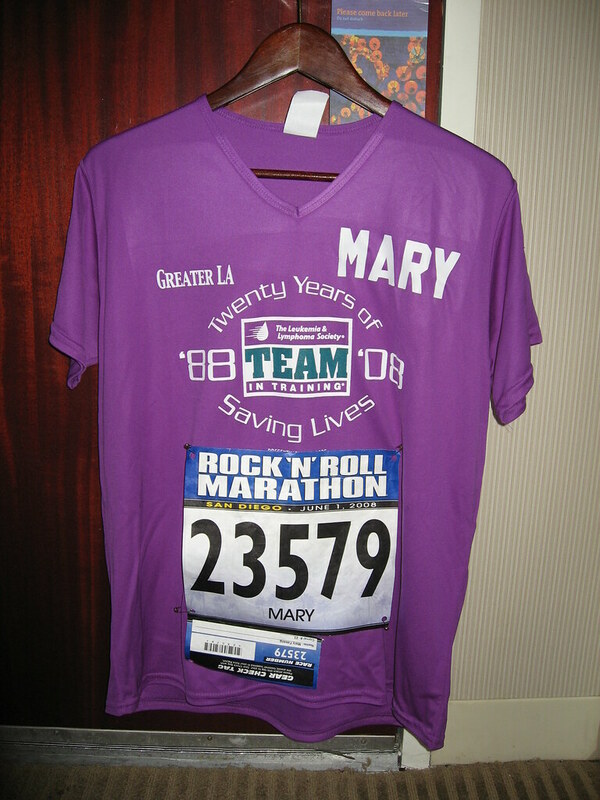 I lined up my outfit in the closet and attached my racing chip and Team in Training emergency contact tag on my shoes and got ready for bed.